When I work on the web page update, the last segment I always do is the History’s Gem of the Month. I have a couple of closets in my house jammed with museum archive materials. It is always fun to pull out a box and look through it to find something interesting. The first thing I pulled out this time is a 1958 Detroit News Pictorial Sunday Magazine, published on August 31, 1958. On Pages 10 and 11 there is the following article about Axel Niemi, the founder of the Gitche Gumee Museum. As is his usual fashion, he added his comments in the margins. Axel says that the second paragraph is a “big lie.” That is probably true on several fronts. One thing for sure is that Axel started to collect agates when he was a young boy, not after World War II as the article suggests. He started numbering and journaling agates during elementary school. 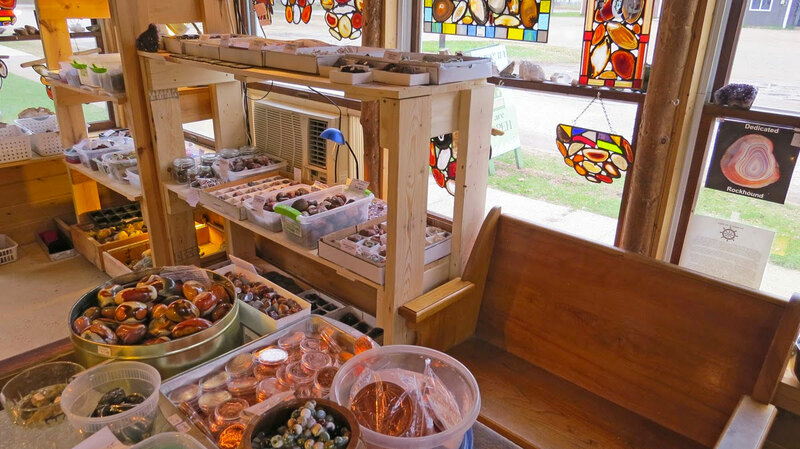 Known as the “agate king” of Grand Marais, Niemi has been an avid collector since he came home from two and a half years of Army service during World War Two. Although he had spent all his life where agates are relatively common, Niemi didn’t “get the fever” until he met an Australian in the South Pacific who carried a clear orange crysolite faceted agate. Today, self-taught in the art of cutting, grinding, sanding, and polishing the semi-precious stones—and with a study course in gemology under his belt—Niemi’s “agate king” title goes undisputed. The 40-year old collector believes he has found the second largest agate ever discovered in the United States. It is an almond-shaped translucent stone weighing five and a half pounds and valued at $200. Only the 10 ½ pound stone now in the Smithsonian Institution in Washington, D.C., surpasses Niemi’s find. Best time for agate hunting, says Niemi, is immediately after a violent storm when deep waves churn the lake bottom and toss up new rocks on the beach. Even then, however, it’s no easy job to find the elusive agates. It takes time—and patience. Using long-handled dipper keeps Niemi’s feet dry when he spots a submerged specimen. It’s easy to confuse a rock having agate value with just another “pretty stone,” says Niemi. Only a few of Niemi’s prize stones are shown here. Polished stones contrast with unfinished rocks. Face-like appearance marks agate Niemi believes is second largest ever found in U.S.